From 1952, may we present Miss Grace Kelly and family. Well, it could be. 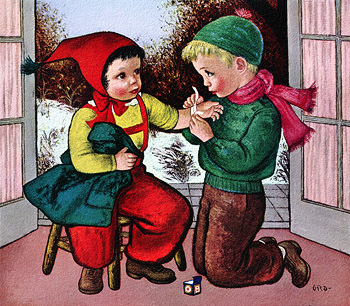 A 1950 illustration by Gladys Rockmore Davis, whose schmaltzy tykes presaged Margaret Keane’s saucer-eyed urchins a decade later and the anime waifs of today. Available in our Gift Shoppe. Reminiscent of sailing ships past, this contemporary “crow’s nest” summer home gives this couple an unusual lookout from which to plot a course of summer fun. The entertainment center: stereo hi-fi, TV, FM/AM and FM stereo radio in a room divider from Motorola’s Designer and Decorator Collection — specially designed pieces you’ll find only in the fine-furniture department of leading stores and salons. If fine furniture is just as important to you as stereo hi-fi sound, you’ll particularly appreciate Motorola’s exclusive Drexel models. These unique pieces combine authentic Drexel craftsmanship with features like the Vibrasonic System that adds reflected sound energy to recorded music . . . Apparently there is something universally right about the special appeal of Coca-Cola to human tastes and thirsts. In more than 100 countries, the taste of Coke is so well liked, the good taste of Coke so well recognized, that over 58 million times each day someone, somewhere, enjoys Coca-Cola . . . The words above, written in 1958, are still applicable today even if the venue (“famous Varadero Beach”) isn’t, Castro’s revolution having swept Cuba by the end of the year. Artist unknown. Honored by Doctors of Motors, America's expert mechanics, who actively express their piston ring preference by installing millions of Perfect Circles every year. Illustrated: GX Steel Oil Ring, one of 62 types of Perfect Circles . 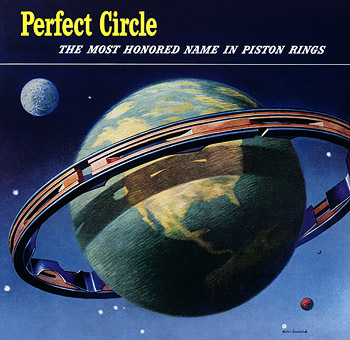 . .
A 1950 illustration by John Howard for Perfect Circle piston rings. We have to wonder if they also made planetary gears. We’re all living with plastics today! Nation-wide enthusiasm has elevated versatile, colorful and economical plastics to key materials that brighten modern living. 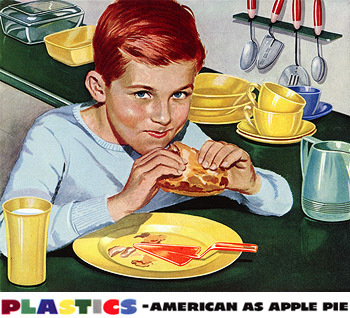 Yes, in national acceptance, plastics are as American as apple pie! Across the land, Americans welcome the friendly touch plastics give to daily living. STYRON (Dow Polystyrene) is transforming numerous practical housewares into exciting new beauties, leads the parade in toyland . 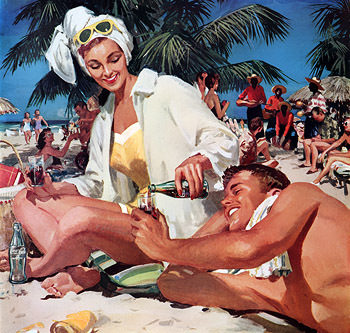 . .
A super-terrific 1950 illustration for Dow Chemical by Artist Unknown. Everything’s plastic but the pie. And probably the kid. ≈ Where on Earth Could You Find Such Service? You feel a genuine friendliness when a TWA hostess smiles “hello,” and sense relaxation as soon as you settle in your TWA Constellation seat. Guest-of-honor attention anticipates your needs, caters to every wish and satisfies your new-found appetite with a meal you’ll talk about for days! 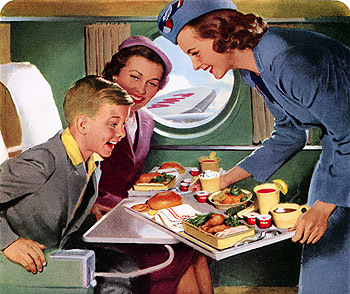 Yes, you’ll like your trip by TWA Constellation. Where on earth could you find such service? The last time we flew, we were treated to a two-course meal: pretzel followed by a plastic cup of warm ginger ale. When shipments are RUSH and the terminal is roaring — count on Chevrolet trucks to deliver the goods. These rugged haulers move more loads, cover more roads, than any other trucks in America. The dependable, businesslike way they get jobs done makes them the No. 1 Carriers for a nation on the move! 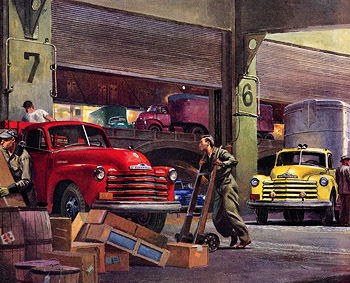 Below we present the left half of a giant illustration by Peter Helck of the 1952 line of Chevrolet medium-duty trucks. A great Dual-Range Performer with Spectacular Power and Economy! This 1952 Pontiac ragtop was among the last GM cars with a two-piece windshield. 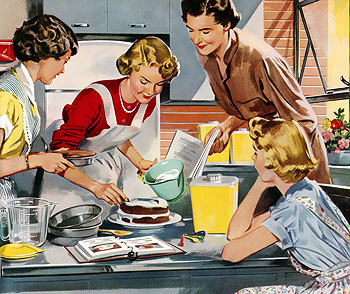 At school or at home, prospects were never brighter for the junior miss learning to preside over a kitchen of her own. What a world of wonderful new things for her to study — appliances and housewares galore . . . time-saving, work-saving, more beautiful than ever before! And especially remarkable are the serviceable, colorful plastics which are so much a part of modern living — not only in the kitchen but throughout the home. The story of plastics, in housewares and appliances, furnishings and fabrics, is a story of fabulous new raw materials, and the molders and fabricators who use them. To this growing plastics industry, Dow supplies Styron (Dow polystyrene), saran, Styrofoam — and many basic chemicals such as phenol, styrene, vinyl chloride . 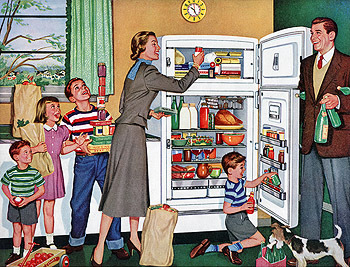 . .
A colorful mid-century kitchen tableau, set amid the first faint stirrings and beatings and whirrings of the Tupperware era. 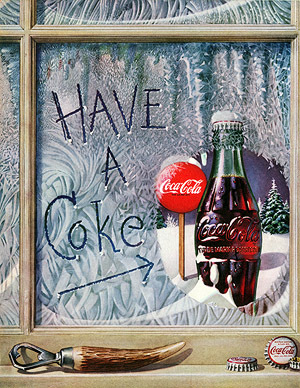 This frosty scene, which might at first look like a Christmastime ad, appeared in August 1952, when a bottle of Coke was the next best thing to air conditioning. You are not alone when you admire the picture below. Because never before has any car won such instant acclaim as the Nash Golden Airflyte — already the choice of thousands of distinguished Americans! Here you see beauty that is entirely new . 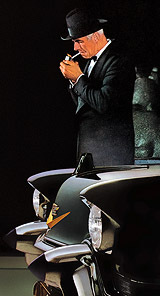 . . the swift, clean, continental styling of Pinin Farina, world’s most famous custom designer. Look inside. You’ll find the widest seats . . . The 1952 Nash Ambassador Custom Golden Airflyte motoring briskly along the road to oblivion. Overlooking Oblivion Boulevard: Fallingwater with curves. 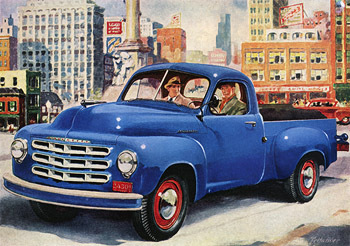 A Studebaker truck stands out in looks and gas saving. Check the record. Talk with owners. Find out how impressively Studebaker trucks are cutting costs in all kinds of handling. Hundreds of thousands of sturdy Studebakers are rolling up amazing savings constantly. See any Studebaker dealer for proof. 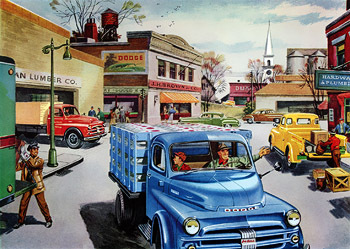 The third of today’s blue vehicles is this 1952 Dodge pickup truck in a pleasant representation of the Anytown business district before malls and Wal-Mart. ≈ Elmer, the Pilot’s Friend! “Born” in the CAA machine shop, Elmer is a remarkably lifelike steel and rubber dummy, designed for studies in improving shoulder harness for pilots. Elmer is so cleverly designed that his compressibility, flexibility, center of gravity, muscular contraction and natural relaxation are almost exactly that of the human body. He even has a roll of “flesh” above the belt when he is bent over! Elmer is an example of how Civil Aeronautics Administration scientists worked to improve air transportation. In automobile transportation, scientists have also been at work. An advance in this field is Conoco Super Motor Oil . 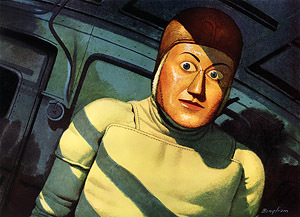 . .
From 1952 comes this strangely affecting illustration by James Bingham for Continental Oil Co., the final frame of which shows poor Elmer at a Conoco service station, lying sideways in the back seat of a convertible being driven by an airline pilot. 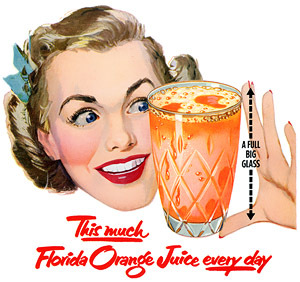 This 1952 illustration of a lady who really likes her OJ comes on the heels of Pete Hawley’s work for the same Florida Citrus Commission ad campaign. 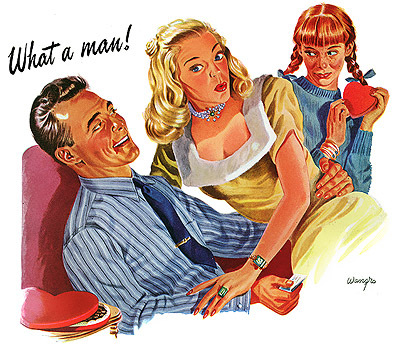 Overall we like his ads better, although this gal has a certain pulpy appeal. You may see store after store, open to full view of passing traffic. No barriers to keep you from seeing right in . . . just a sweeping expanse of clear plate glass, including the doors. Merchants have discovered that when more people can see in, more people come in. More attention. More traffic. More sales . 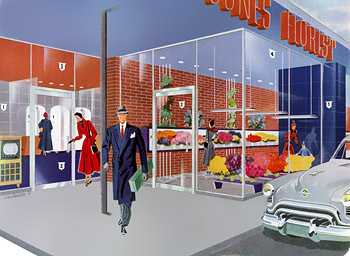 . .
A 1949 illustration by someone named Newhauser, depicting a Futuramic Oldsmobile parked outside a Futuramic Flower Shoppe, right next door to the Futuramic Video Emporium. If you think all ginger ales are alike . . . If you have forgotten how delicious ginger ale can be . . . If you’ve never tasted ginger ale . . . Try CANADA DRY — the original pale dry ginger ale. Here’s America’s “Ginger-Upper.” It’s sparkling. It’s light. It brims with the intriguing flavor of finest Jamaica ginger, brought to peak flavor by Canada Dry’s exclusive, secret Liquid Ginger Process . 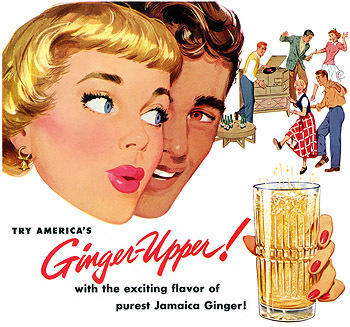 . .
Now it can be told: Canada Dry Ginger Ale, which isn’t really Canadian at all, contains “finest Jamaica ginger,” thanks to the “secret Liquid Ginger Process.” The illustration is from 1949. Headed by the Super Chief and The Chief, the great fleet of Santa Fe trains between Chicago and California offers a choice of fine accommodations to satisfy every taste and fit every pocketbook. For smooth-riding comfort . . . friendly hospitality . . . delicious Fred Harvey meals . . . fascinating scenery . 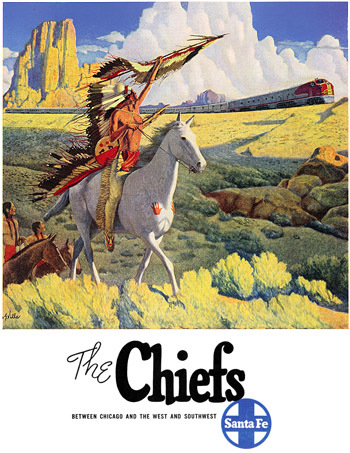 . . travel Santa Fe — the Chief Way! A 1949 illustration by the award-winning muralist Hernando Villa (1881-1952), who for 40 years was house artist for the Santa Fe railway as well as the designer of its “Chief’s head” logo. 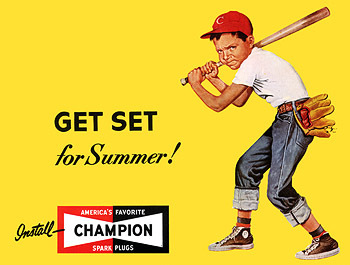 A great billboard-style illustration for Champion spark plugs from 1952. Talk to truck buyers who really know what’s going on. They’ll tell you Studebaker has scored again with America’s most progressive truck designs. They mean, of course, the sensationally improved line of medium-duty trucks that Studebaker offers economy-minded owners. Studebaker calls these new 1½ and 2-ton trucks its 16A and 17A series. Truck operators call them marvels of pulling power. Cabs are extra roomy and extra cool — with foot-operated floor ventilation — restful new Adjusto-Air seat cushion . 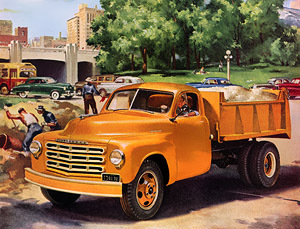 . .
An orange 1949 Studebaker with 2-ton dump body illustrated by Frederic Tellander, the Norman Rockwell of the pickup truck. You can always tell an Oldsmobile “88” — not just by the numerals on the rear fender — but also by the way it goes! The first time you see that sleek Futuramic hood sweep ahead of the field, you get a hint of that “Rocket” Engine power. But to appreciate an “88,” you’ve got to try it! Then — and only then — can you feel for yourself that swift-surging Rocket response . . . so smoothly delivered by Hydra-Matic Drive. And only then will you experience the maneuverability that goes with the “88’s” compact Body by Fisher. And only then will you know the unique “88” sensation — that soaring, airborne ease of travel! 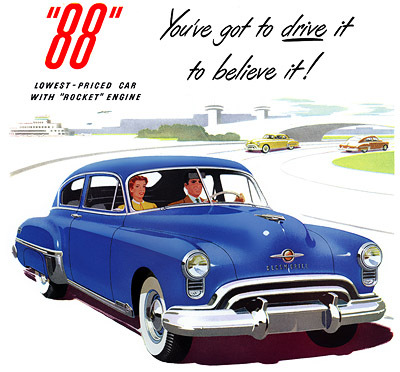 You’ve got to drive it to believe it — and your Oldsmobile dealer invites you to do so soon! Phone him — make a date with the “88” — discover the most thrilling New Thrill of all! GM’s Hydra-Matic automatic transmission, which turned ten in 1949, was so popular it was standard equipment on 88 and 98 series Oldsmobiles that year, a situation that ended with the start of the Korean War. 1949 was also a high-water mark for General Motors postwar styling, the company’s larger cars being especially well-proportioned with a pleasing emphasis on form that diminished with the stubbier, chromier 1950 models. If you prize value, Plymouth is the winner in the low-priced field. Of 22 quality features found in most high-priced cars, low-priced Plymouth has 21 — low- priced car “A” has 13 — low-priced car “B” has 4 ! See the new Quality Chart at your Plymouth dealer’s now. Then — better still — drive all three . 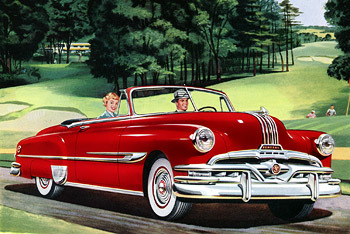 . .
For young people today, the Plymouth brand is slowly becoming as obscure as DeSoto or Hudson. 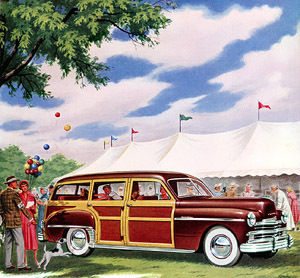 From 1949 comes this Plymouth woody, appealingly illustrated by H. Miller. The best way to tell new car value is by comparison. Compare the new Plymouth — feature for feature, dollar for dollar, mile for mile — to any car in any price range. Then drive “all three” — and let the ride decide! 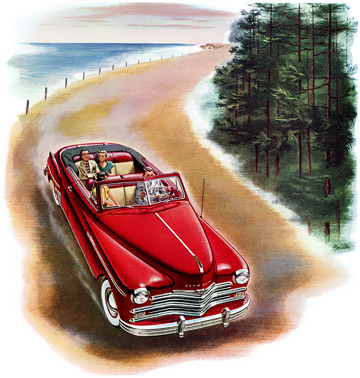 This beautiful rendering of a 1949 Plymouth convertible, which comes to us across the decades courtesy of one H. Miller, is the latest addition to Ye Olde Plan59 Print Shoppe. ≈ Smoothest-Riding Car We’ve Ever Owned! Talk for a while with Chevrolet owners, and you will agree that they are the most enthusiastic owner group of all! That is true because men and women know that Chevrolet brings them BIG-CAR QUALITY AT LOWEST COST. They will tell you they are equally pleased with Chevrolet’s Big-Car styling, Big-Car Performance and Big-Car dependability — BIG-CAR QUALITY in every detail of appearance, performance and reliability . 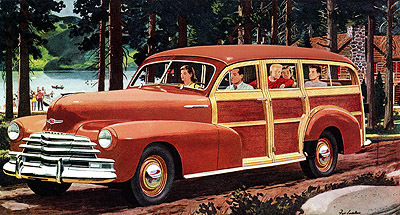 . .
An illustration by Fred Ludekens of a 1947 Chevrolet station wagon in what used to be a familiar, almost generic venue for the ads of summer — family arriving at their rustic cabin by the lake somewhere in what the copywriters called the North Woods. It’s official now — silence is golden! In the new Golden Anniversary Packards, you’ll find restful relief from road hum, wind roar and “engine sensation.” Tap the body and you’ll hear no metallic plunk — just a deep, solid thud. And the engine? Quiet as a polite whisper! Stop in soon at your nearby Packard show- room for a look and a listen! 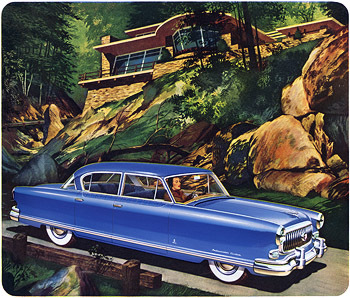 Be sure to ask about PACKARD ULTRAMATIC DRIVE. Through the slimming magic of Melbourne Brindle’s brush comes this swell- and svelte-looking 1949 Packard. Weather prediction: Warm and cozy. To the envied owners of this luxurious new Packard, the coming of winter will be nothing more than a change of landscape! At the first frost, they’ll simply turn a dial on motordom’s most advanced heating and ventilating system. Temperature is automatically controlled. Warmth is uniformly distributed. And you enjoy a silent change of fresh air once every minute, even when the car is standing still! Sound wonderful? It is — and that’s only half the story! For Packard’s exclusive system is ready to delight you, not only in the winter, but all year ’round! So visit your nearest Packard showroom. See a demonstration of how Packard lets you “tune in” the best of every season! Ask the man who owns one. 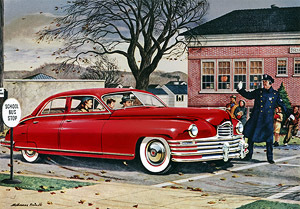 Packard’s first all-new design after World War 2, for its 1948 line, featured what it called “slipstream styling,” an example of the independent carmakers trying to get a jump on the Big Three by coming out with automobiles that at least vaguely resembled the many futuristic renderings of “your postwar car” that were dangled in front of consumers during the carless years of 1942 to 1945. The results, for Packard, Nash and Hudson, were plump, tallish conveyances that bore an unfortunate resemblance to bathtubs on wheels. The red Packard below had the misfortune of rolling out along with the all-new 1948 Cadillac, whose sleek, tailfinned design caused a sensation. 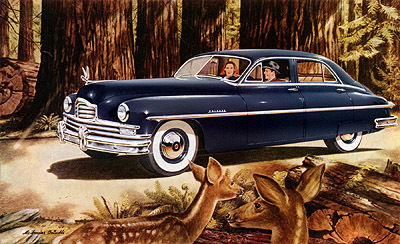 For the 1948-50 Packards, which went over like two-ton lead balloons, the resulting contrast in appearance and appeal helped seal the marque’s doom. Illustration by Melbourne Brindle. Come, come, Goldilocks . . . You’re not going to marry him just because he wears Marlboro shirts! Or are you? 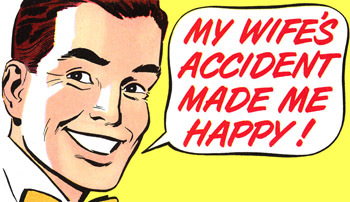 A keen eye for style and a sure sense of value help to make a good husband, at that. P.S. — What a Valentine . . . a most admired, most desired Marlboro shirt! 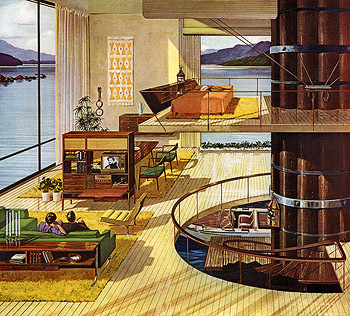 From February 1947, a sweet rendering by Wangro, whose work and name are new to Plan59. Anybody know of more like this? Monday morning “changed color” more than a generation ago . . . when Quadriga Cloth was born. Then, everyday clothes changed from gray to gay. Changed to colors that laughed at washday. And have you seen the good news? 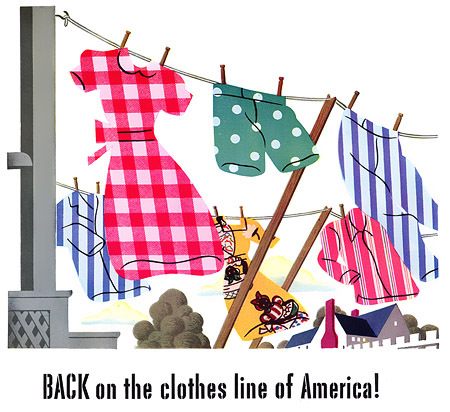 The clotheslines tell it: Quadriga Cloth is back after a wartime scarcity. 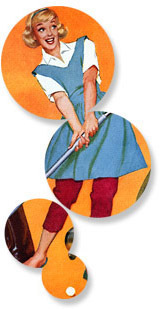 In bright bolts of ready-to-sew, needlized cloth. In clothes ready-to-wear for you and your family . . . daytime dresses, shirts, shorts, pajamas . . .
From 1947, an unsigned illustration of appealing simplicity that looks like something out of a Tom & Jerry cartoon.